Paper Mache is a popular sculptural tradition found in many cultures. It is a technique undertaken by both the novice and the professional artist alike. Paper mache uses common materials to create delicate and temporal works of art. So fragile is the exterior paper skin of the artwork that it requires a solid armature (framework) -- which can be made from wood, wire, duct tape and balloons -- to provide support while it dries. 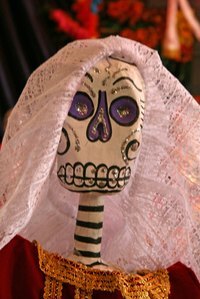 You can use paper mache to create holiday decorations, such as skeletons for Halloween and Day of the Dead celebrations. Use the pliers to straighten both wire coat hangers. Create a "V" shape with one of the hangers. Attach it to the other straightened hanger at the center with masking tape. Use the still straight hanger to make the skeleton's arms. Construct the legs using the "V" shaped hanger. Bend two pipe cleaners in half so that they form a "V" shape. Using masking tape attach these two pipe cleaners together at their bend. Cut a third pipe cleaner in half using scissors and attach to the others with tape. Attach the whole pipe cleaner creation to one end of the coat hanger. Repeat the process for the other three coat hanger ends to create the structures for the skeleton's hands and feet. Inflate the balloon to the size desired for the skeleton's skull. Tie the balloon off and use masking tape to attach it to the straight wire at the same center point as the "V" shaped wire. Tear strips of newspaper and wrap them around the wires until you achieve the desired bulk -- approximately 1/2 inch to 1 inch in diameter -- for the skeleton's arms and legs. Cover completely with an outer layer of masking tape once wrapped, making sure the paper is securely fastened to the wire. Spread out the attached pipe cleaners so they resemble the positioning of fingers and toes. Repeat the paper wrapping and masking tape process described in Step 4 with the pipe cleaners. Create more strips of newspaper. Continue tearing newspaper into strips until your pile of shredded paper is at least twice as big as the skeleton frame. Use a measuring cup to measure out two-and-a-half cups of flour and three cups of water. Pour these into a mixing bowl. Stir until combined. Using one strip of newspaper at a time, dip in the flour and water mixture and smooth on to your skeleton armature. Repeat this process until the entire wire frame is covered in several layers. Find a warm dry place to set the skeleton. Allow it to dry overnight or until no moisture exists on the surface. Use paint to add decorative details once your skeleton is completely dry. Brush on a base coat of black to help hide the newsprint. Wait until the base coat dries. Dip your brush in white paint and add details such as ribs, arm bones and leg bones, as well as teeth and eye sockets. Paper mache can be very messy. If the weather allows, you may want to move this outdoors. Once fully wrapped in newspaper, the skeleton's fingers and toes should only measure about 1/4 inch in diameter.